Video Mount Products, a provider of mounting solutions for the security, commercial, residential, and pro audio/video markets, will showcase its PDS-LCM2B dual large flat panel ceiling mount adapter during 2015 ISC West. The PDS-LCM2B, which now accepts flat panels up to 80 inches, is available for shipping at an MSRP of $199.95. The PDS-LCM2B flat panel dual ceiling mount adapter. 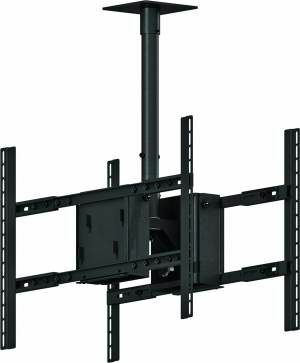 Increased from a maximum of 70-inch flat panels, the PDS-LCM2B adapter allows the VMP PDS-LCB large flat panel tilt ceiling mount to accommodate two 37- to 80-inch flat panel displays back-to-back with a combined weight of up to 360 pounds. The PDS-LCM2B is a multi-function option for a host of installations, such as in restaurants, bars, health clubs, and arenas.